Trivia Time With GameWorks Ybor City! Yeah you guessed it, this weeks trivia is centered around our friends over at GameWorks Ybor City! If you have never been over there, first of all shame on you, and secondly, pay close attention to this week&apos;s trivia cause I have some hot givieways to bestow up a few lucky winners! This is normally $14.99 vallue for each, so I suggest you guys get your trivia hats on if you wanna take advantage of this. Its a great prize package if you and a special person in your life are doing a date night, or something to that effect! But enough of me yapping, let&apos;s hop into the trivia! Here are the rules again, just in case you forgot...1 - You have to be following us on Twitter.com (www.VisitTampaBay.com/Twitter); 2- Answer one question about GameWorks Ybor City: 3 - You have to re-tweet the original tweet in order to be eligible to win (a lot of people forget this one, so make sure you re-tweet); and 4 - You have to answer the question on Twitter and be the first to do so. Pretty simple huh! 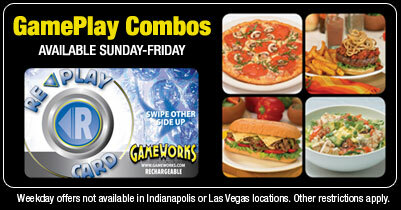 When and where was the first GameWorks location opened? What is the name of the entertainment company that purchased GameWorks in May of 2005? Alright guys, there you go! First to answer correctly gets the prizes! And remember, if you have won one of our contests within the last 30 days, then you will have to sit this one out! Stay tuned for more trivia and things to do in Tampa Bay!